Variant gives away what her plans are on the cover of this issue. Oh boy ... Where do I start? 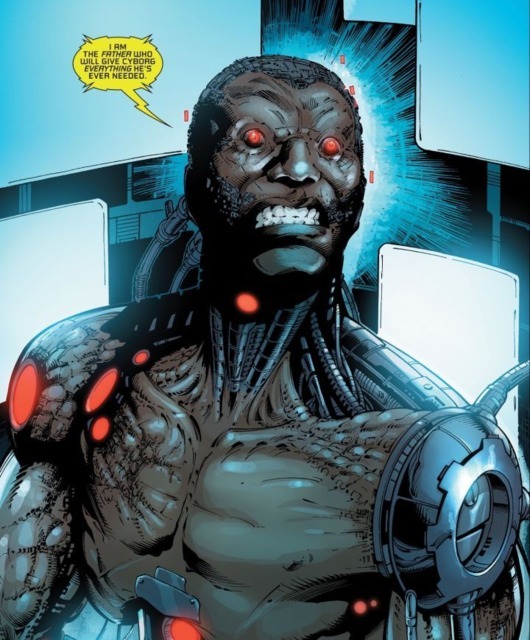 With the characterization that they were giving Vic Stone, Cyborg, and the interesting things they were setting up early on in the story (issues 1-6), like who the mysterious figure was that was parading as Cyborg's dad (Silas), or how they implied that they were going to explore the Motherbox technology that helps make Cyborg tick. These are the things that had me stoked to read the series. But it just didn't live up to it. In fact, it went from interesting to rehashed faster than you can say "Motherboxer." And when it hit rehashed territory, man did it ever read slowly. Grueling, even. So what initially started off as an upfront gathering of cool ideas and character-building, turned into ... well, a bunch of messy villain appearances and single-issue events, even though the storylines continue for several issues each. Story arc 1: The Imitation of Life, went up to the 9th issue. Cyborg defeats OTAC (Silas' impersonator) at least temporarily. The 2nd arc: Danger in Detroit, begins exploring the mental side of Cyborg. But honestly, and unfortunately, I won't be getting beyond issue 12 for that conclusion. For people that were already familiar with Cyborg, I can only imagine the mental groans that took place as they rolled their eyes into oblivion and beyond, passing out from sheer repeat storylines. For people with limited knowledge of the character, like me, it just led to villains being introduced and fought within a single issue, especially towards the last few issues in this review. Ugh, it was a grind to read those. Where did it go wrong, you might ask? Now, I don't know how long John Semper Jr. has been writing. A brief look into his credits says he's done a lot of stuff for animation and film. But for this, at least up to this point, I just had to jump off board and hope that the book gets better in time so I can jump back on because as it stands, it's just simply playing it safe in the old traditional way of comic books. There's not a lot of future potential in exploring face punches exclusively or melting your enemies within a page or two of their introduction. Do I want any punches or face melts? Oh heck yeah, but I want the punches to have some weight to them, tied to emotions. And I want the melting to have some sweet circumstantial buildup that makes them better. The first thing I noticed, even early on in the issues, was that the dialogue would sometimes come off as corny or contrived. This I can forgive because sometimes writers have awesome ideas, but dialogue delivery can be hard on them. Sometimes writers just aren't strong in that area, but they can grow. This is what I initially thought would be the case because there were scenes that were written very good. However, if the dialogue mistakes were then counteracted by cool world-building, character-building, and concept-building, and any other kind of interesting "building," then that's what I'm personally after! That'll have me hanging around for many issues. At worst, I'd jump off and on the series. But this? The whole later part of the story and the next arc were just not my cup of coffee. Starting with issue 7, where they revealed what Variant was really up to. That woman that was blown up in the explosion during her time in Iraq? That was Variant, and she actually seemed okay at first. A woman that put her life at risk for the possibility to become what Cyborg is. She was saved, basically ran through the same kind of treatment that Cyborg had received from his dad, Silas. But this time it was Silas' doppelganger that was doing the treatment, and the government unknowingly gave the villain a Motherbox, thinking that they could save their agent or at the least get the important information she had obtained when she was on the run, just before her explosion. Which worked. She became Variant and was supposedly having difficulty remembering what secrets she'd learned just before her near-death experience. Variant then moved into the second stage of her schemes, when she had to manipulate Cyborg to get him back to the place in which she had been "running" from. 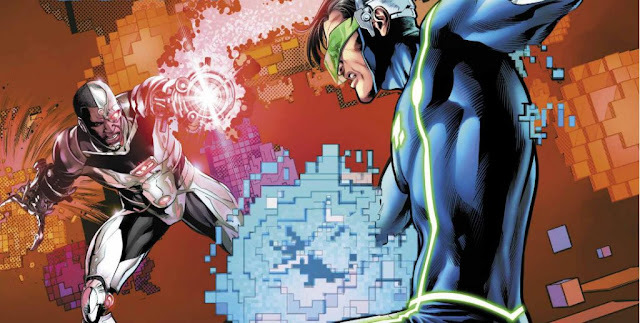 Turns out she was part of a group that is trying out manuever all governments, using the boom tube technology from Cyborg, then were intent on taking posession of all the nuclear war facilities around the globe in order to prevent any further destruction from the untrustable governments of the world. Short story shorter, she ends up being defeated and locked up. That should have been an indicator to me of what to expect next. But I still gave the benefit of the doubt because I liked the first six issues as much as I did. By the time things got to issue 10, where they introduce the Rat Lord - a man that has learned how to train the rats that he grew up with and turn that skill into a lucrative drug delivery service over the years - things get even more clunky. Black Narcissus, yes that's her name (after the flower), is also introduced in this issue and is a woman that is after justice for her neighborhood. She has the intelligence to get battle it out with Cyborg, but she feels so thrown in that it's very hard to observe her as little more than a distraction. 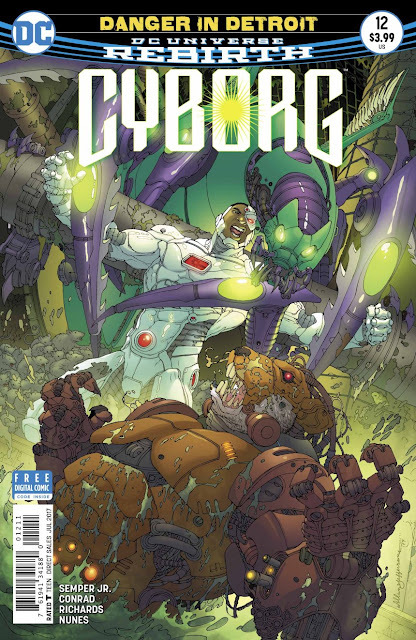 At the end of the issue, Cyborg is being taken down by innumerable rats which causes him to go into the recesses of his mind. That's where things get interesting, at least for a little while. In issue 11 you find out this digital person (Keiji Otani) H8-Bit (kinda like that name, actually) Cyborg is fighting in the blocked parts of his mind used to be a childhood friend he built video games with. Kinda touching. Bam, defeated, killed even, so no luck of exploring that more. Ugh. H8-Bit during his almost mounting to something of a supervillain. Issue 12, Rat Lord (Rizzo Rattama) turns into supervillain Ratattack, then bam, defeated within a page, basically. It was at this time I realized I had a Loch Ness monster comin' round that wanted my $3.99. I'm glad I told my comic shop to take me off the pull list after reading the last 3 issues. Ratattack (Rizzo Rattama) debuts and exits within pages in this issue. See, as a writer myself, this is one of the things I fear about my own indie comic hobby; writing stories that go nowhere and single-issue events that make even less sense as a drawn out concept. It's a terrible thought to lead not only yourself as a writer, but the readers down to a hollow end. If this stuff was written with a little more heart or planning, or perhaps just a better understanding of comics, I think Semper Jr. could do a great job. The first few issues shows that potential. That being said, I'd jump back on if there were some stories that explored the cooler things they mentioned in the first 6 issues again. And I don't hate the writer, they may have tried some stuff that just didn't work, or editors may have changed his plans. Rob Liefeld walked away from DC because he had several issues planned, showed up for work one day and they wanted him to change everything. So it happens. The book's not going in a direction that would've been so much cooler to read. I anticipated more and may have given a stoked vibe that resulted in someone else picking up the title. I hope not, after reading issues 11 & 12, I'd feel bad if they did. But hey, it happens. H8-Bit during that brief time he thought he'd be around longer. As a personal side note, when redesigning a character, what in the hell is up with not giving Cyborg a cooler looking suit? 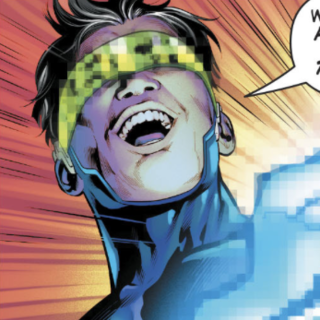 He was now able to change his appearance back to looking human, and he never changed into anything more than Vic Stone, and his suit was still the same. Nothing against the artists, Pelletier, Conrad, etc., they do what DC tells them. But if I had a chance to change his suit, as an artist I'd make Cyborg look freakin' killer awesome, especially during a reboot. At least I'd like to hope so. As far as DC titles, I'm still catching up with Deathstroke and Gotham Academy Second Semester. Deathstroke has been surprisingly good so far, up to issue 12, so I'll have to cover that one in an upcoming article. I also fell behind on New Superman, so I'll have to buy the issues, get caught up with that and write a review as well. I'll catch you then!